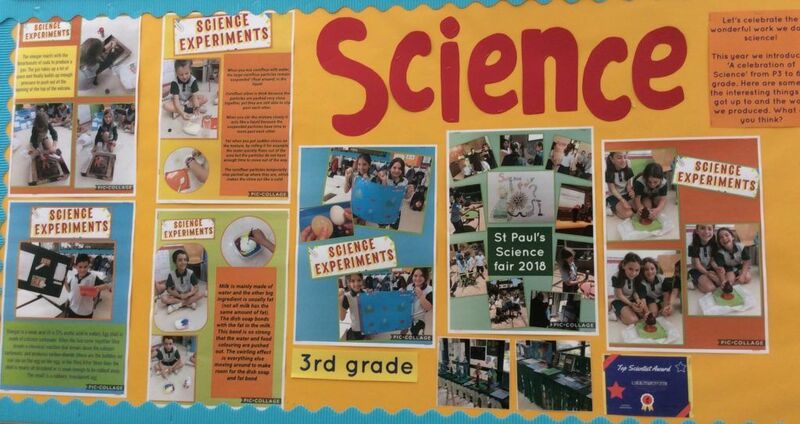 This year´s Science Fair celebrated together with Europa International School at St Paul´s was a huge success, once again! There was an incredible amount of effort put in by all children in preparation for the big day and their work definitely did not disappoint. The presentations were all very interesting and the children delivered them confidently and fluently in perfect English. This year the presentation prize went to two Pri5 girls from St Paul´s, Lola Escarmis and Lara Fahy. The poster explanations were also of a very high standard. They were beautifully presented with lots of scientific detail and in depth observations, this year Ágata Romero, Ariadna Ollé, Elena López and Gabriela Benmayor from PRI6 children took the title. During the afternoon everyone had the opportunity to interact and play with recycled models to discover how and why they worked. The company Guixotde8 brought a large selection of homemade recycled games for them to experiment with and encouraged them to discuss how and why they moved as they did. The students had to problem solve, use their hand-eye coordination and work cooperatively to successfully maneuver these models and they loved it! To finish off the day, our guest speaker Maria Isabel Pividori, Associate Professor at the Autonomous University of Barcelona and mother of a St Paul´s student, shared with the children her area of expertise, chemistry and biochemistry. They were hugely engaged and very willing to take part in an experiment at the end. Thank you to Europa International School for sharing this day with us once again, thank you to Maria Isabel for sharing your knowledge, well done to all of the children who participated in the Science Fair, to all of the finalists and of course congratulations to the winners. It is encouraging to see so many enthusiastic and motivated scientists in the making, well done!